Early today, Skype entered the growing mobile video market with a new client for iOS devices, bringing a rival to Apple’s (s aapl) FaceTime video chat service. Although I carry a Google (s goog) Android phone, I still drink from the iOS fountain via the latest iPod touch and its two cameras, and I use FaceTime nearly every day with my son. He doesn’t live with me, so we share much of our daily lives through Facetime: him on an iPhone 4 and me on my iPod or a Mac. Skype mobile video quality is quite good, but not as sharp what I’ve seen using FaceTime. I’d estimate Skype’s quality to be about 90 percent of Apple’s product. Audio quality was superb; a testament to Skype’s development on audio codecs over the years. Just as with FaceTime, the Skype client will automatically orient itself in portrait or landscape, based on how you hold the handset. One minor advantage that Skype holds over FaceTime is a presence indicator, as you can see who’s signed in to Skype and thus, available to take a video or voice call. I often call my son on FaceTime, but he’s not on Wi-Fi and not available: I only know this after I try to make the FaceTime call. Skype supports simple switching of cameras from front to rear and you can easily turn the camera off during a call as well. You can see Brad’s thoughts on the video experience on his blog. Overall, the Skype mobile video experience is pleasing so far. Over the long term, I’ll be curious to see how much the client drains the battery on iOS devices and how it works over 3G. Since I have a mobile broadband hotspot on both my Android phone and Galaxy Tab devices, I may tote the iPod touch and try a video call over 3G later today. 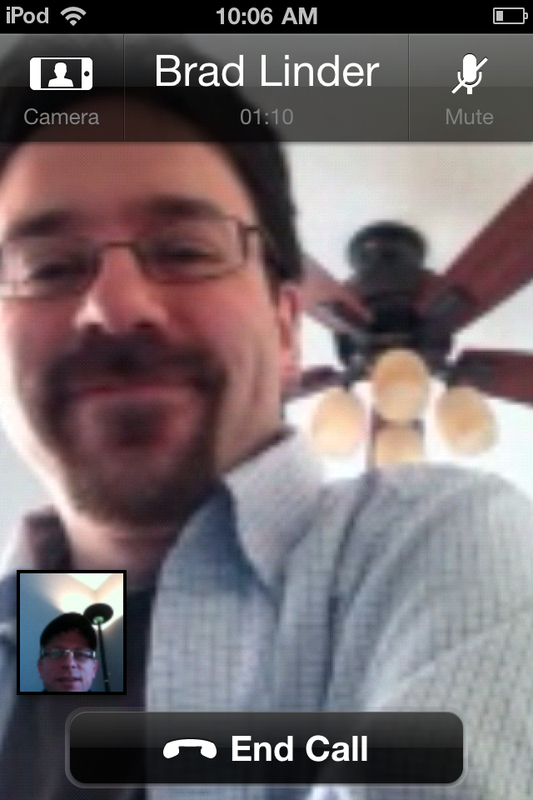 Speaking of Android, my next question to Skype is: When do the other platforms gain this nifty video calling feature? I just upgraded my Skype to launch the video feature a couple of days ago, and I LOVE it. I too think it is convenient to be able to see who is available, unlike Facetime. The video quality is not as good. In my opinion, I would say that it is possibly 70% or less of the Facetime client. But another thing I noticed is the fact that Skype does not freeze up as often as Facetime. I can be sitting right in front of my wireless router and the Facetime video will still freeze up after a few minutes, even though the audio may at times continue. Skype has not done this as of yet. I think they might have sacrificed the bitrate of the video stream for quality of duration. I give Skype two thumbs up for my iPhone 4! Skype is way behind the curve, and it seems like they’ve under-resourced the development. They still aren’t using iOS notifications (Fring and others are) so that the battery usage is through the roof if you want to stay connected to their system. Seems to me like too little, too late given the competition. Skype Video Calling for iOS is terrible. Poor Video Quality and Sound. FaceTime is much better than Skype because it has a better Video Quality than Skype and better Sound. For now.. Skype is gone. Skype need to work on this terrible Update. After 2nd try to upgrade my Samsung Vibrant on Bell Canada (first try fried my SD card like the other 1000s of people who experienced it too) to 2.2 … I finally could run Skype! Alas, the battery is draining the cell in an unprecedented rate. Without Skype I get in idle time 2% drain an hour. With Skype in the background – but WITHOUT auto synch (!) the drain is … 7% an hour!!! Unbelievable. Is there not a FaceTime Client for Android ? I thought Apple making it open and plan is to make Facetime worldwide defacto “standard” for video chat but I could be wrong. I hope Facetime on iPad 2 since the iPad has about 10 million users and growing rapidly. FaceTime is only available on Apple devices at the moment. When introducing FaceTime, Jobs said that it would opened up to third-party use in the future, but that hasn’t happened yet.